Third-grader Teeny Sweeney has been one-upped by seemingly perfect Amanda Mayweather too many times. 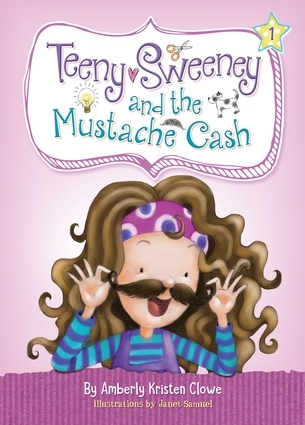 When their teacher assigns a project to create a business plan, Teeny knows she's destined for success. After all, with two entrepreneurs as parents, business sense is in her blood! The best laid plans, though, often go awry. Teeny will have to learn that God's plan is one she can always trust, and that with prayer it is possible to love everyone—even Amanda Mayweather. With Teeny, young readers will learn that even when things don't seem to work out, you can always trust God's plan. Amberly Kristen Clowe is a writer and former elementary teacher who spends her days with her book-loving husband while singing the ABCs with her daughter and reading jokes to her son. She lives in Houston, Texas. Janet Samuel is a full-time illustrator whose work is primarily aimed towards children's books. She has worked with a variety of clients, including The Art Group, Fernleigh Books, Harvest House Publishers, Lion Hudson, Parragon, Scholastic, and Usborne. She lives in South Wales.